This is the last of my images from Friday evening. Before photographing the Delta Aquariid meteors, I stopped off at Coleyville to shoot this panorama of the Milky Way. I planned this shot using Stellarium and Google Maps, so I knew that this dirt road would be lined up with the plane of the Milky Way at 8:30pm, and I think it worked out quite well. 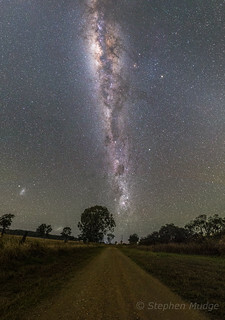 The panorama was made by stitching twelve images, each taken with the 6D and Samyang 14mm f/2.8 lens at f/2.8 and 6400 iso.